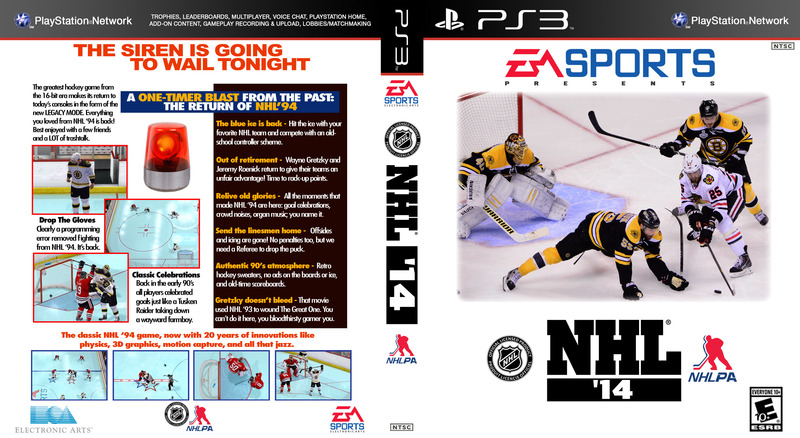 With the release of NHL ’14 only days away, I thought I’d make an alternate cover for the game in the style of NHL ’94, seeing as they included the much-hyped Legacy Mode this year. Feel free to print this sucker and place it into your copy. I used the Genesis box art because the Super Nintendo version wouldn’t translate all that well to a contemporary game case. I omitted the legalese and I shrunk the ESRB Rating to match whatever rating system was on that Genesis cover. Other than that it looks like the real deal. PS3 fans: If this cover proves to be popular I’ll make a PS3 one too (I’ll update this post). These game covers are a lot of work! Speaking of which, I learned that I hate writing copy. The folks who have to write the blurbs for physical media packaging are heroes. Special thanks to Evan Eckard and his very handy 360 template (links below the video), which accelerated this design a great deal. If you like this please check out this NHL ’94 Chair Mat on my other blog. UPDATE: The PS3 cover has now been added. Special thanks to Deviantartist AdrianThomassen92 for the template. 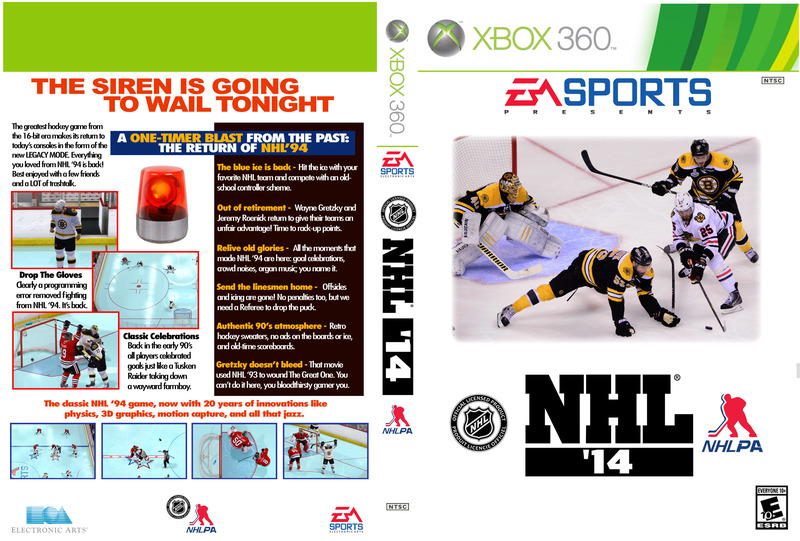 Posted on September 4, 2013, in Hockey Ideas, NHL and tagged EA Sports, hockey video games, NHL, NHL 14, NHL 94, Video Games. Bookmark the permalink. 2 Comments. I literally just completed downloading about 20 images to print out for replacement game covers, primarily for my PS3 collection, from NeoGAF. I very much want this to include for NHL 14.